Is Fall A Good Time To Sell My House? If you have been thinking of selling your house, but think you have missed the opportunity this year, think again. 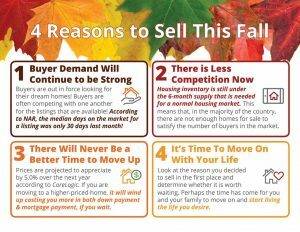 Fall can be a great time to sell, especially this year. Inventory is still low and there are buyers out there waiting for a home like yours to come on the market. Check out this interesting inforgraph….. https://goo.gl/mGf11U and Call me for a complimentary valuation on your home today!